Has your driveway become dull looking? Give it a makeover before Winter hits and create one of the best driveways in Wolverhampton! Known for having expert driveway designers and unique colour and pattern options, at Cobblecrete you can let your imagination run wild. By choosing us for your new driveway, you will have something that’s made to an impressive standard, using the strongest and most durable materials on the market. Our promise is that your new driveway will look great for many years without splitting, cracking, fading, or swelling. Nowadays, people are moving away from the old traditional styles of driveways in Wolverhampton and going for something a little more stylish. If you would like to achieve popular design looks such as the cobblestone or slate, we offer fantastic pattern imprinted concrete that’s low maintenance and without the huge price tag… This means we’re great for domestic and commercial driveways! For any commercial project such as drive-throughs and shop exteriors, you will get a maintenance-free solution so that your driveway looks exceptional all year round. Our team will install your driveway in rapid times, and we will help you when choosing a plan. Before any work is started, we will come to your property for a chat and inspection, so that we can achieve the most accurate end result. 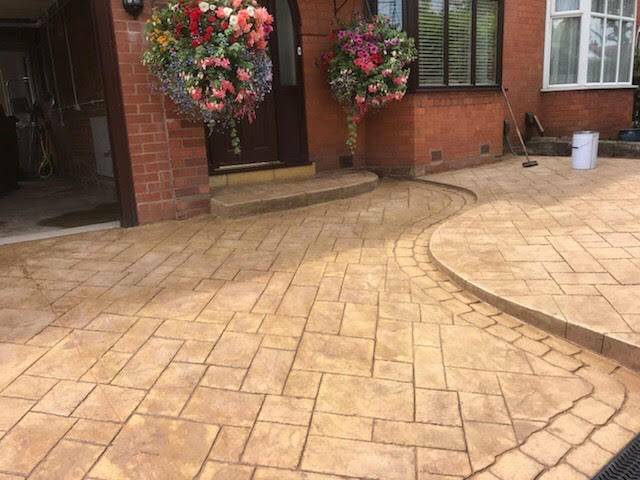 After installation, you will be amazed by how exceptional your exterior looks, and our driveways in Wolverhampton will even add value to your property! If you would like a quick and professional solution for your business, all our commercial driveways in Wolverhampton are installed using quick and safe methods for your reassurance. To enquire about home driveways, contact us today and we can get the process started. Areas we are particular popular in include Tettenhall and Codsall!